Rally racing is quite the spectacle to watch as drivers with co-drivers navigate all types of roads through timed stages at insane speeds with specially modified production or purpose built cars. The type of cars that we all wish we could own and wheel through the streets performing high speed counter-steering turns. Unfortunately that is not a reality for most of us and RC versions will have to suffice. Luckily, Tamiya has many offerings for the rally segment and has produced rally cars and trucks dating back to the early 80’s. One of its first was the Audi Quattro Rally (#58036) and one of its best known rally cars is the awesome Porsche 959 Paris-Dakar Rally Winner (#58059). 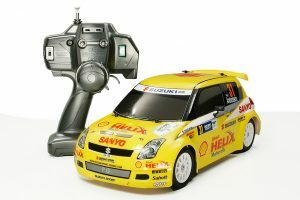 Currently, Tamiya has several different types of rally cars that are based on different chassis platforms and are modeled after various car manufacturers. 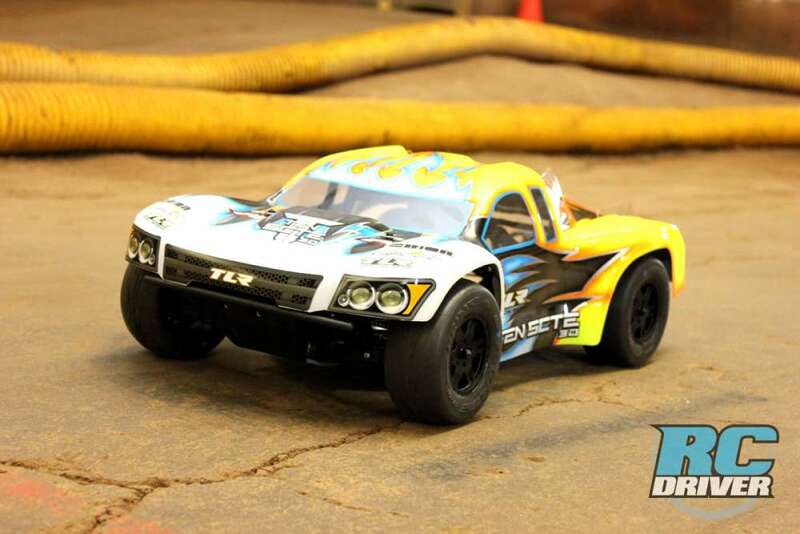 For the purpose of this article we are just focusing on the electric powered rally cars produced by Tamiya and are not including the rally trucks or nitro powered vehicles. 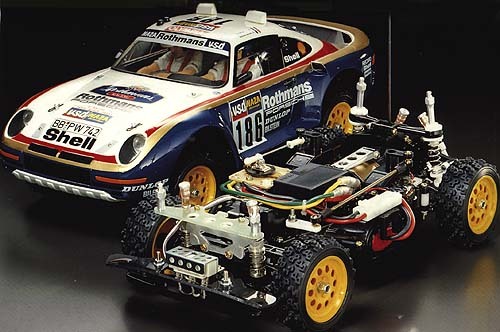 Released in 1986, the Tamiya Porsche 959 Paris-Dakar Rally Winner (#58059) is one awesome RC model. It came outfitted with ball bearings, oil-filled shocks, modified motor, full interior, working headlights and a great looking body. 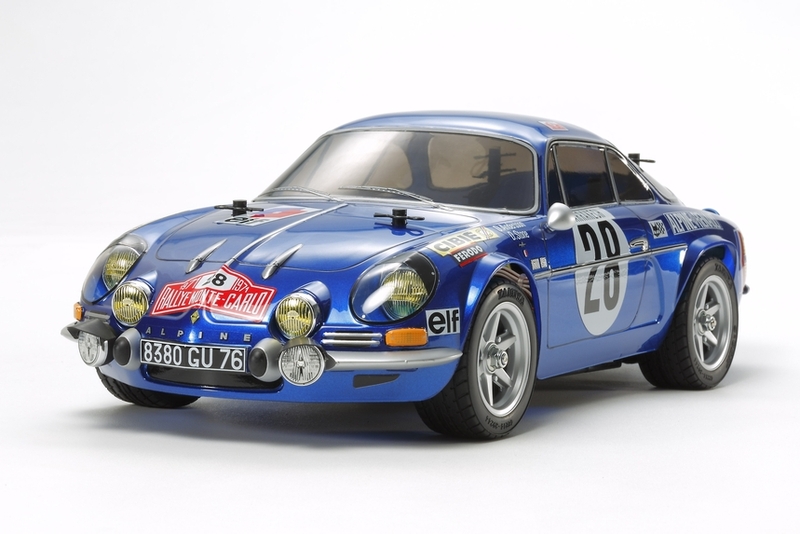 Modeled after the full size Renault rally car that competed in the 1971 running for the Monte Carlo Rally, is the sweet looking Tamiya Renault Alpine A110 ’71 (#58591). It depicts the car prepped by the Renault Alpine works team which took first place in the race and was accompanied by four other Alpine A110s that finished in the top ten. The car’s rear wheel drive setup with backbone chassis produced superior traction that led to numerous rally wins. Underneath sits the compact Tamiya M-06 rear wheel drive, bathtub-type chassis. 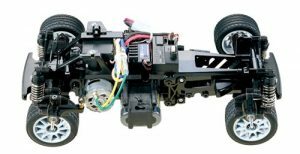 The battery is positioned longitudinally in the middle of the chassis while the electronics are mounted on either side and the 540 brushed motor sits behind the rear wheels. Friction shocks are used at the front and rear along with fully independent double wishbone suspension. Tamiya Renault Alpine A110 ’71 based on the M-06 chassis. Here is the rear wheel drive Tamiya M-06 chassis used on the Renault Alpine A110. 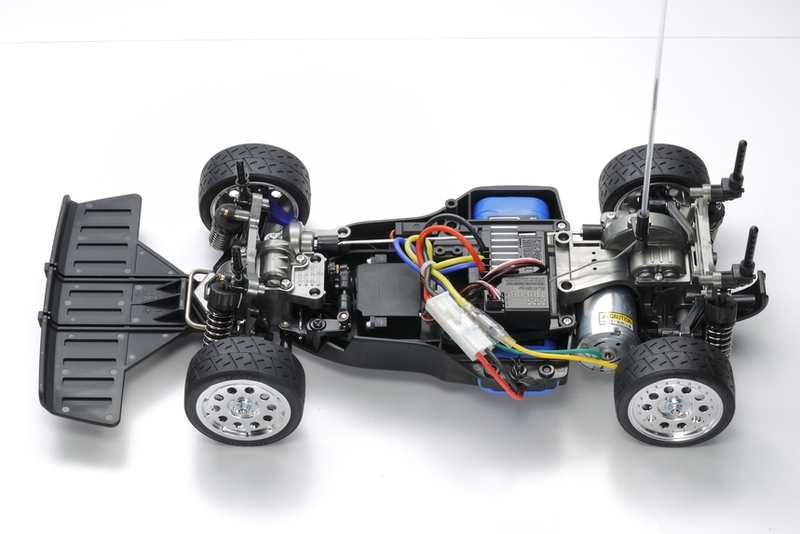 One of the current platforms that Tamiya has utilized on several of its releases is the four-wheel-drive TT-02 chassis. The TT-02 is the successor to the TT-01 chassis platform as it comes with several new features to make it a better performer and is perfect for the new kit builder to assemble and learn from. Its design is optimized to take advantage of the existing electronics that are out on the market while the cornering and top speed has been boosted. 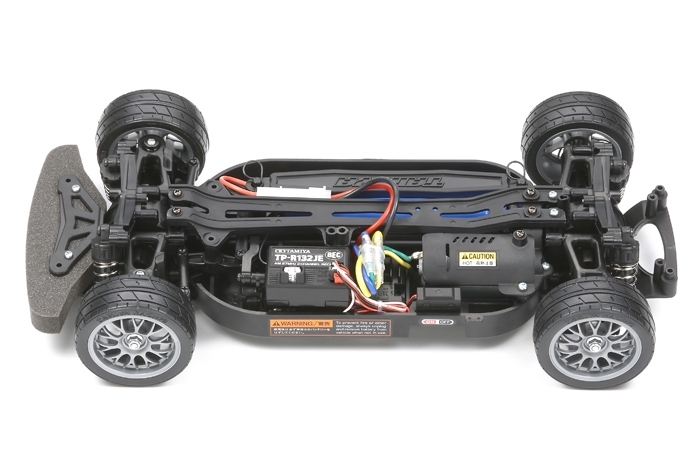 Like most of Tamiya’s chassis, the TT-02 can have its durability and performance enhanced with the numerous Tamiya Hop-Up option parts that are available. You are able to configure the TT-02 for ground hugging on-road use or it can be raised with increased suspension travel for rally racing duties. Other features include symmetrical suspension components for ease of assembly, beveled bathtub style chassis to provide more cornering clearance, shaft-driven 4WD setup and even brake disc shaped wheel hubs for some scale realism. 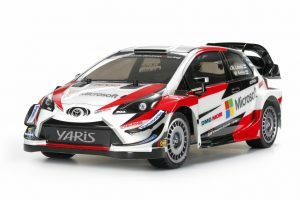 For rally offerings, Tamiya has four cars currently spec’d with the TT-02 chassis: the Subaru Impreza Monte-Carlo ’99 (#58631), the Gazoo Racing TRD 86 (#58574), the Toyota Gazoo Racing WRT Yaris WRC (#58659) and the Lancia Delta Integrale (#58570). The adaptable and easy to build Tamiya TT-02 chassis. Tamiya Subaru Impreza Monte-Carlo ’99 (#58631) – Modeled after the two door version of the Impreza that raced in 1999 that was highly balanced with a 4-cylinder turbocharged all-aluminum boxer engine, a drive-by-wire throttle and semi-automatic 6-speed transmission. Tamiya Toyota Gazoo Racing WRT Yaris WRC (#58659) – This kit of the Toyota Gazoo Racing WRT Yaris competed in the 2018 WRC (World Rally Championship). The multi-part body accurately captures the shape of the aerodynamically prepared car and is equipped with a 374hp, 1.6 liter, 4-cylinder turbo engine and 4-wheel drive with active center diff. 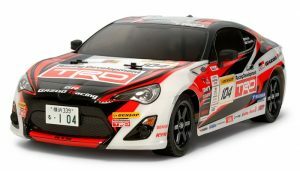 Tamiya Gazoo Racing TRD 86 (#58574) – The full-size TRD 86 took part in the 2012 Shinshiro Rally stage of the TRD Rally Challenge Series held in Japan in which this RC version is modeled after. Tamiya Lancia Delta Integrale (#58570) – The Lancia Delta Integrale body has been married to various Tamiya chassis platforms over the years. It was a serious rally contender and well-known by rally fans thanks to its 6 back-to-back titles in the late 80’s and early 90’s. 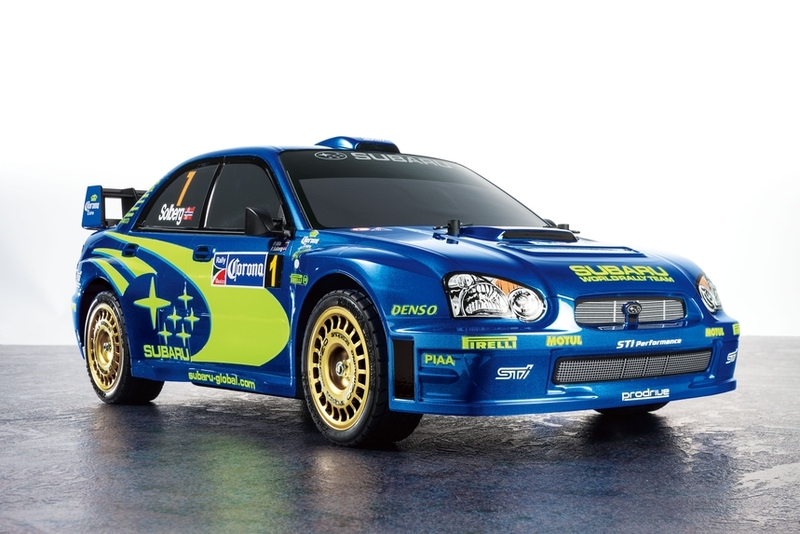 This is a limited edition re-release of the Subaru Impreza that raced in the 2004 WRC season. 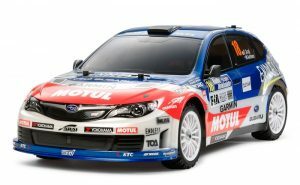 The realistic, scale polycarbonate body comes with plastic side view mirrors, the distinctive sectioned Impreza rear wing and all the vinyl stickers to recreate the car that ran in the 2004 Rally of Mexico. 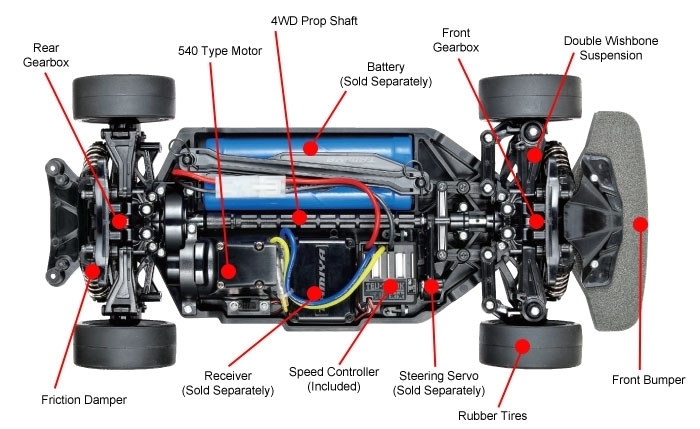 Underneath is the evolved shaft-driven 4WD TT-01 Type-E chassis. The center of gravity is improved with the motor and battery re-positioned and features a more rigid bathtub style chassis. 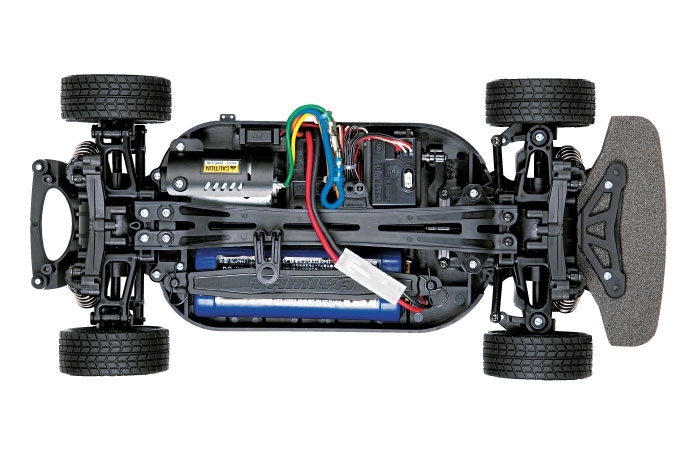 Tamiya includes the TBLE-02S speed control that is able to run either a brushless or a brushed motor. A standard 540 brushed motor is included to get you up and running. 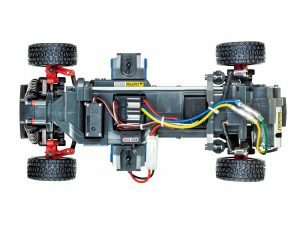 The Tamiya TT-01 Type-E chassis has a low CG, balanced design, 4-wheel double wishbone suspension system and front and rear gear diffs driven by a center shaft. Standing out from the rest of the rally cars featured here is the Tamiya Lancia 037 Rally (#58654). It is the only one that has a body made of ABS plastic instead of polycarbonate and the only one that comes with a full interior. 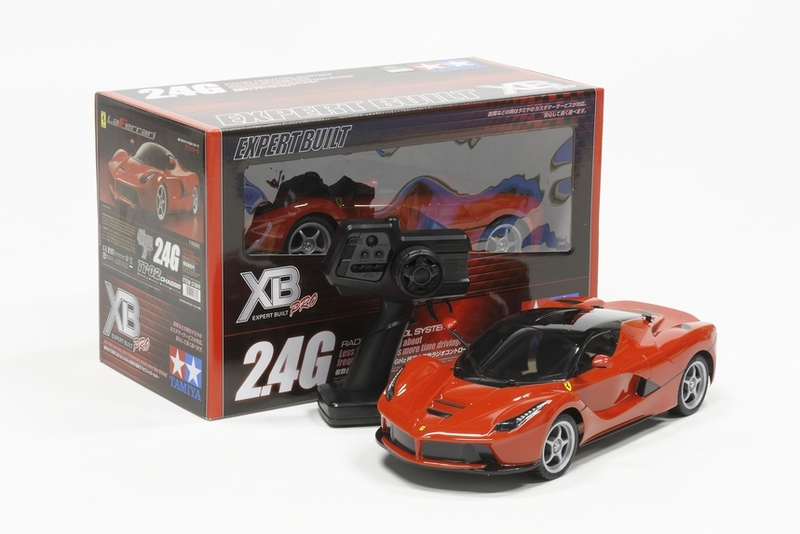 Injected molded ABS plastic allows for added scale detail in the body and a solid mounting platform for the interior complete with driver and co-driver figures. 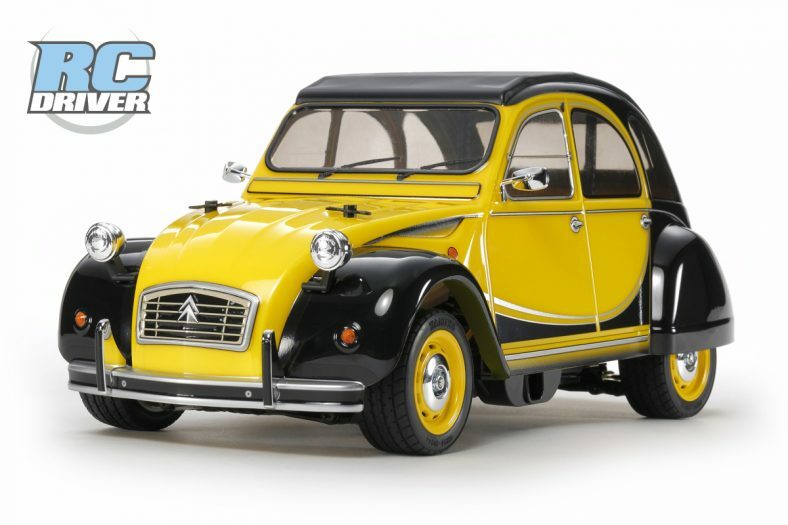 Other details that set this model apart are the metal plated light cases for headlights, taillights and fog lamps, side mirrors and windshield wipers. The great-looking realistic body sits on top of Tamiya’s TA-02 S chassis. The ‘S’ signifies a shortened wheelbase to accommodate the true scale form of the real Lancia 037 rally car. 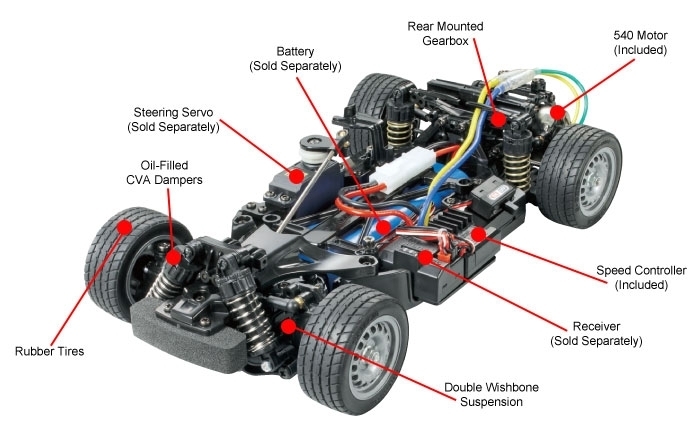 It has a tub chassis with rear ball differential and front gear differential, oil-filled shocks and a brushed motor paired to Tamiya’s TBLE-02S speed control. 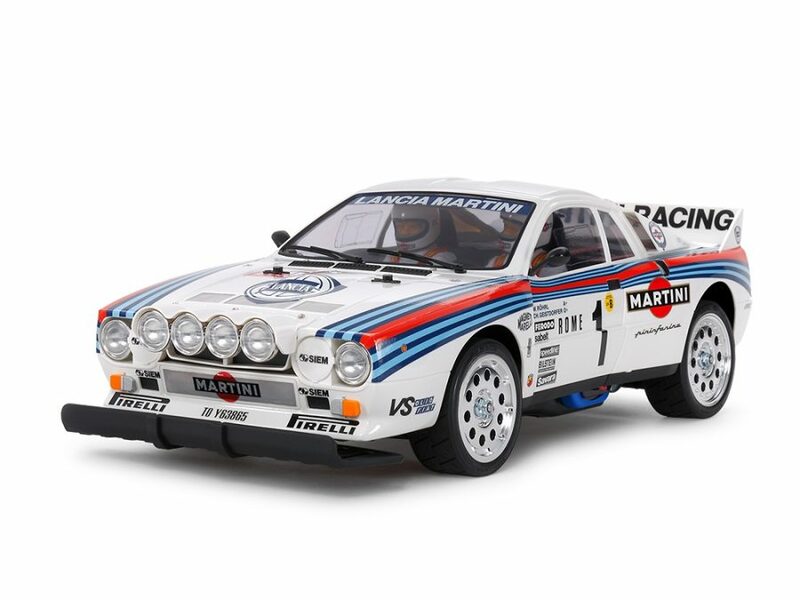 The super scale looking Tamiya Lancia 037 Rally TA02S (#58654). 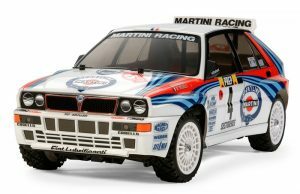 Tamiya used a variant of its TA-02 chassis for the Lancia 037 Rally which has a shortened wheelbase and is called the TA-02S. 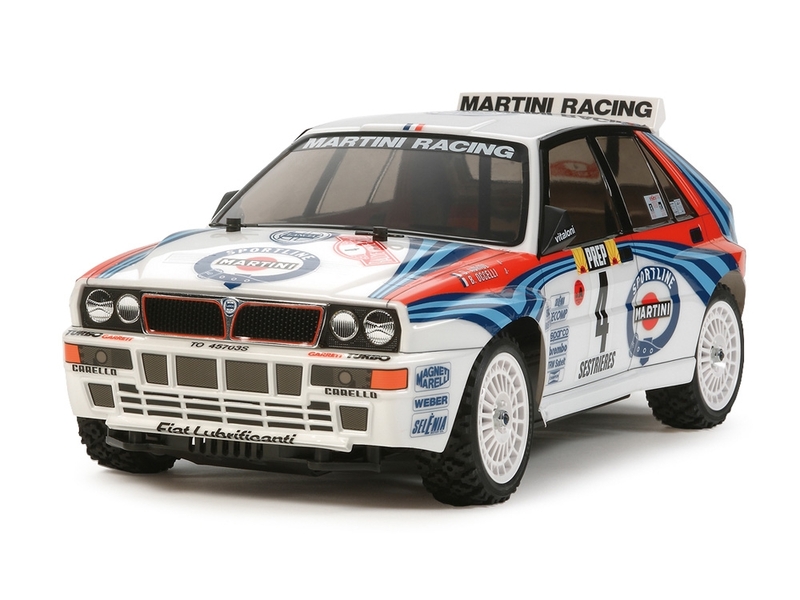 These next two Tamiya rally cars, the Lancia Delta Integrale (#58569) and the Subaru Impreza WRX STI Team Arai (#58528) are based on the same XV-01 chassis. 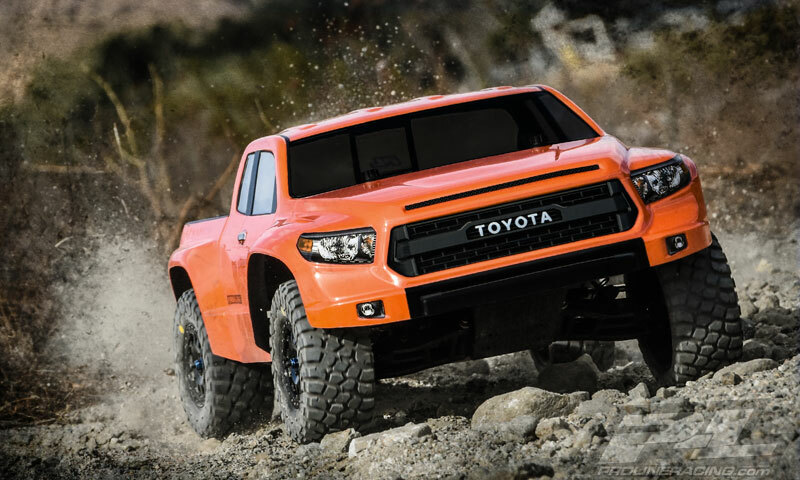 It is more of a purpose-built chassis platform specifically designed to handle on- and off-road duties. 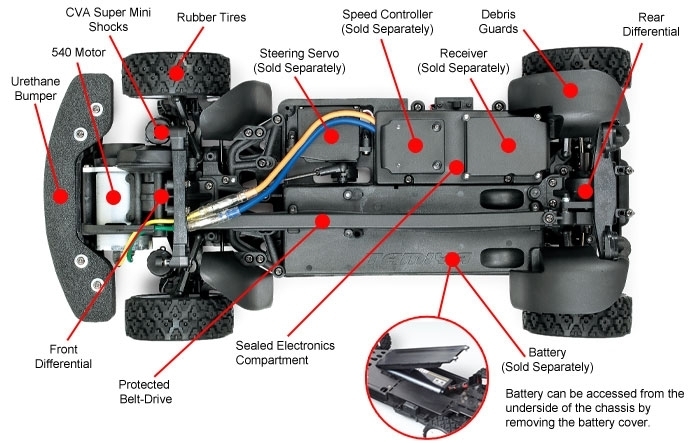 It has a belt-driven 4WD system with the motor mounted in the front and the gearboxes, drive belt, battery and electronics are protected by covers from dirt and debris. You will also find detachable wheel well liners to keep mud and gravel from getting into the chassis and if it does, holes in the bottom of the chassis help direct the dirt back out. The gear diffs are adjustable by using different viscosities of differential oils while the suspension is controlled by smooth operating oil-filled shocks. The Tamiya Lancia Delta Integrale is the same body that is found on the TT-02 chassis mentioned above and the Tamiya Subaru Impreza WRX STI Team Arai is based on the rally car that saw victory during the 211 Asia-Pacific Rally Championship. The Impreza body is faithfully reproduced in durable polycarbonate complete with injected molded roof intake and square-shaped side view mirrors. 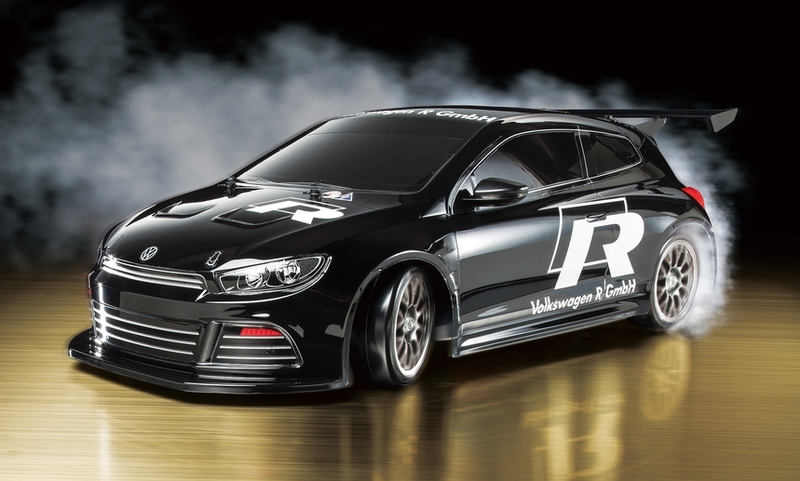 Rounding out the overall look of the rally winner is its 16-spoke wheels wrapped with rally block tires. 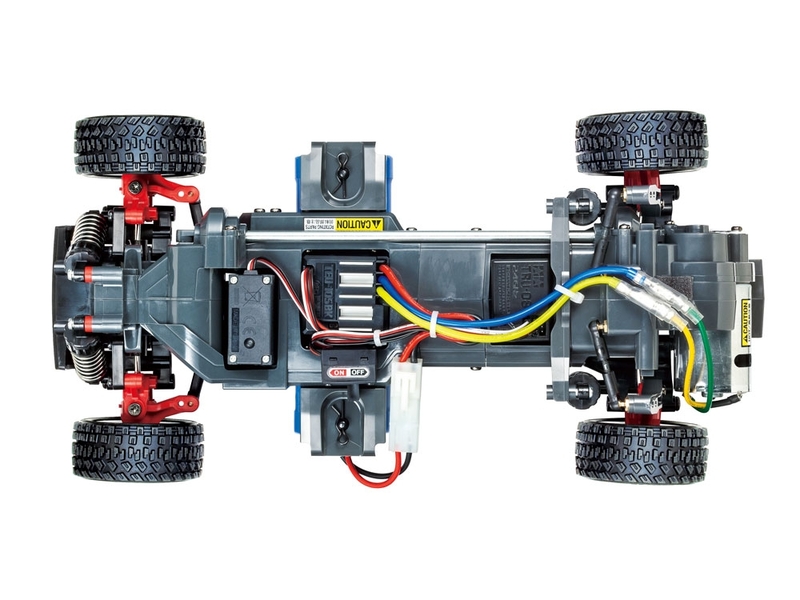 The Tamiya XV-01 4WD belt-driven chassis is designed with inner wheel well liners to keep dirt and gravel from getting into the chassis and for added protection the vital components are protected under covers. Inspired by the Volkswagen Beetle’s that competed on the global rally circuit from the 1950’s through to the 1980’s, Tamiya created the Volkswagen Beetle Rally (#58650). 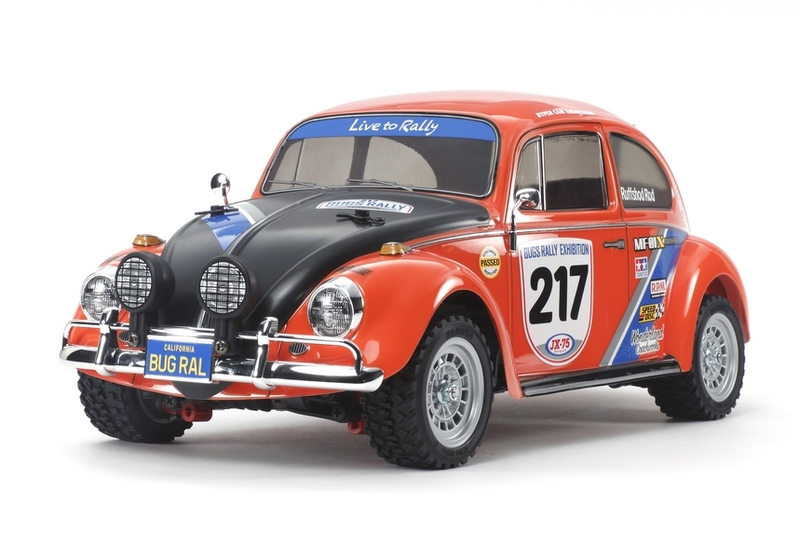 The Beetle was a formidable rally racing platform thanks to its exceptional reliability and uncomplicated upkeep. 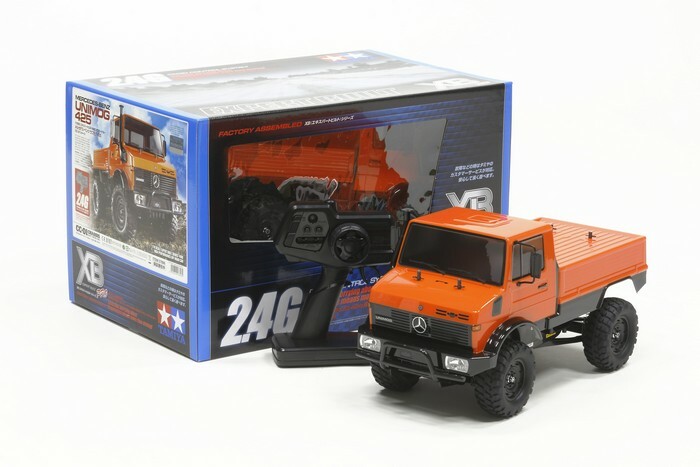 Likewise, the RC version is based on Tamiya’s proven shaft-driven 4WD MF-01X chassis that is right at home on either tarmac or flat dirt. Four-wheel independent double wishbone suspension is supported by friction dampers at all four corners, rally block tires provide great grip while the motor drives the rear wheels and a dogbone with propeller shaft drives the front. The Beetle body is molded from polycarbonate and separate pieces are provided for the auxiliary light buckets and metal-plated parts are utilized for the bumpers and side view mirrors. A three-piece resin monocoque design makes up the shaft-driven 4WD MF-01X chassis. 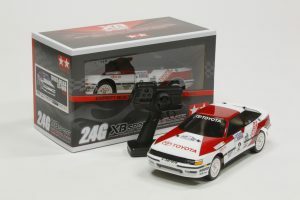 Rounding out this list of Tamiya rally cars are two rides that come ready-to-run (RTR) – the Toyota Celica GT-Four 1990 (#46617) and the Suzuki Swift Super 1600 Germany ‘05 (#57754). They each come out of the box fully assembled with the body painted and detailed as shown in the photos here. All you need to supply is a battery pack for the car and “AA” batteries the included transmitter. The Tamiya Toyota Celica GT-Four 1990 comes with the reliable Tamiya TT-01 ES 4WD chassis. This car is a replica of the full-size Celica that took four wins including the Rally of Great Britain during the 1990 World Rally Championship season. Under the Suzuki Swift Super 1600 Germany ’05 sits the M03M front motor, front wheel drive chassis. The Swift is modeled after the Suzuki Swift 1600 that ran in the companion series to the WRC named the Junior World Rally Championship (JWRC). This series was restricted to drivers under the age of 28 and driving 2WD vehicles. Tamiya spec’d the TT-01 ES 4WD chassis for the Toyota Celica which comes already assembled for you. The M03M is the only car in the list that is front wheel drive and makes it a fun car to drive.